We have evolved on the basis of a surplus of attention. What allowed us to invent new forms of living together? I would like to not reduce that question to its rationally controlled version, a simplification of Darwin’s observation of how life balances the equation between chance mutation and approximate repetition. Life doesn’t fit in the model of individual agents competing in a challenging environment. We need to talk about what happens when we’re not under threat of predators, starvation or the weather; after we have built the technology that makes those chores easier. When we have peace of mind. What to do with the attention left over after we spent what’s required on the bare necessities? If nowadays it seems like our attention span is not wide enough anymore, like too many distractions are competing for a place in our mind, we need to ask, who and what are asking for attention? Should we feed the supplicant with what it wants or should we answer it with another question? Can we give that kind of attention, which is meant to be affected by life and its potential for transformation. Can we complement the relation of offer and demand, with a cohabitation in a common culture. Cardboard Attention will ask these questions starting from a riddle, “the Three Prisoner Five Hats Problem”, a mathematical problem, at the center of an economical paradigm which initiated the study of offer and demand in a world of self conscious beings. 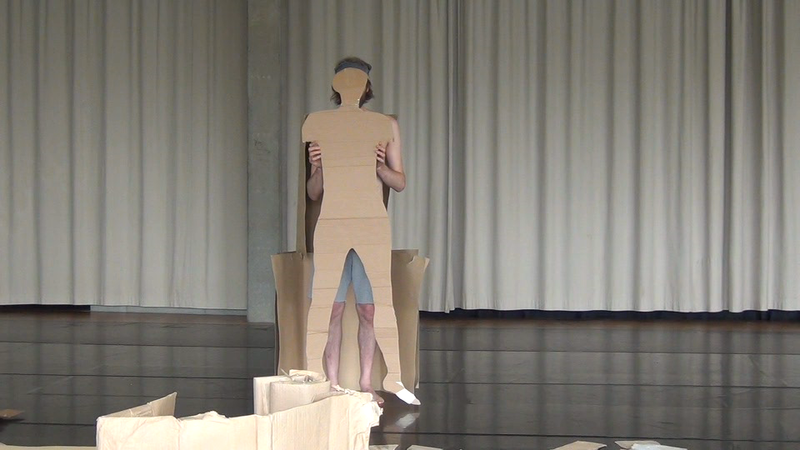 Cardboard Attention is a demonstration. An act not in protest against the excessive demands put on us, but motivated exactly by the feeling that it’s all too much. Cardboard Attention doesn’t resist against the immeasurable overload. It manifests the lack of measure as a chance for living too much, a chance of generously inhabiting that excess.